DtL: How did the idea for the film come about? Carlotta Summers: Butterflies has been a film 3 1/2 years in the making, but a story formed from a lifetime of personal experience. As a child I was often bullied and stereotyped. I have always been prejudged for my appearance. Being a multiracial young woman, I grew up searching for a sense of identity. Never belonging and never really feeling like I fit in. Throughout grade school and to the present day, as I work in an industry that prides itself on appearances, I have periodically fought inner demons whose power stems from what young girls said to me long ago. Words hurt. And they stay with you long after the encounter. I wrote this piece, not to condemn the people that bullied me, because I don’t think that helps; I wrote this piece so that people can see different perspectives on the same issue. Something that helped me when I went through a hard time was placing myself in their shoes. Everyone has a story and everyone wants to be heard. This piece is about forgiveness and moving on. DtL: Can you tell us a bit about the film? 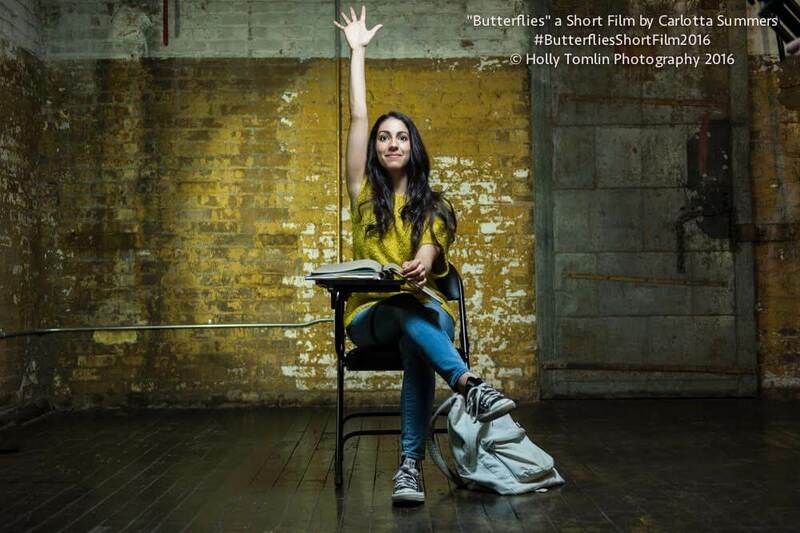 Carlotta: Butterflies is a narrative drama that follows a young girl, Melanie, as she goes through her freshman year of high school. It is a drama along the lines of Jessica Sharzer’s “Speak,” Sophia Coppola’s “Lick the Star,” and Felix Thompson’s “King Jack,” all films that show the more complex emotional and psychological side of bullying that so often goes unnoticed. This film tackles the power of words and the transfer of pain from the person bullying to the individual targeted, to provide a new perspective on a familiar story. Having been teased in the past, Melanie is looking for a fresh start as she begins high school. What does it feel like when you are trapped in a life you cannot seem to change? What should you do? Who can you turn to? The answers to these questions might surprise you. DtL: Why do you feel it is important to make a film with this message? Carlotta: According to Ditch the Label research, 1 in 2 people aged between 13-25 experience bullying each year. It’s not going to stop, if we don’t take a stand. This film is a dark and personal look at the psychological effects of bullying and its impact on everyone around them, including the people that bully. I wanted to give life to a character learning how to cope with the negative forces around her. So often we see in the news, the story of a young child who takes their life, as a result of bullying. I know personally what it is like to feel worthless and at the mercy of another’s words. There were lessons I have learned that I want to pass along to the next generation. Until we manage to stop bullying, I want to make it a little easier for those who experience it, with a fresh new approach, not just something you see in an after school special. This film’s purpose is to give strength to those who have been bullied as well as provoke a discussion on what we can do to better confront the issue. Cady McClain: I think this film comes at an important time. In the online world (where we spend more and more of our time, regrettably) the louder, more aggressive voices seem to be having some success in shouting others down. It is creating an environment where women have to prepare to have their point of view, their voice; prepare to be attacked before they even speak their mind. This cannot become the status quo. Women have been silencing themselves for decades. It would be a great injustice to pass on the habit to the younger generation. Carlotta: I agree with Cady. In addition to the subject matter of Butterflies, we are reaching out to strong, diverse actresses for additional roles, who can handle the emotional elements of the film. It is no secret that there is an underrepresentation of women and minorities in Hollywood. In 2015, females comprised 22% of protagonists on the big screen. In addition, it was noted in a recent poll by the Centre for the Study of Women in Television & Film that only 27% of major character roles were going to Black, Latina, Asian, and females of other races/ethnicities. I have spent years crafting these complex characters so that we can spread our message, push the boundaries of artistic filmmaking, and defy Hollywood conventions. Audrey Lorea: There are endless reasons a film like this is so vital. Even with all of the recent dialogue and buzz-worthy celebrity attention to bullying, we still have tragic news stories surfacing of these young kids committing suicide. Any sort of narrative that could act as a preventative light at the end of a tunnel for young people can literally save a life. A story like this would have been a huge game changer for me when I was young. DtL: Have you ever experienced bullying? If so, can you tell us what happened and how you overcame it? Carlotta: I grew up in a small town in Mitchellville, Maryland. I remember how happy I was as a kid. I remember when the first day of school was the most exciting thing in the world. I craved knowledge. Somewhere along the line, I got the sense that this was a bad thing. Other students would tease me for raising my hand too often. For always having the answers. For my physical appearance and so on. In elementary school, my mom who was a single mother and needed a job; she found one at the only place she could at the time: my school. As a result, children correlated the fact that I did well, with the fact that my mother worked there. I was called various vicious names, regarding my mixed background. I was told I was worthless. What stung even more were the teachers in the room who saw what was happening but did not intervene. When you are the target of such harassment at such a young age, the thing you want more than anything in the world, is for someone to intervene. Yes, you want to teach children to stand up for themselves, but the feeling of complete isolation and self worth is reliant on the fact that people are telling you, you are worthless. I wanted more than anything for someone to say I was worth it. I have never understood, especially for young women who attack other young women, why we do so. It is hard enough already for women to receive acknowledgement for their achievements, and I feel that we should be lifting each other up rather then tearing each other down. I think that before we can change anything, we first have to look at ourselves. Audrey: Absolutely, I experienced bullying from elementary school all the way through high school. But the worst years were (of course) in junior high. In the sixth grade, the bullying and toxicity reached such a level that I was actually suicidal. And in my silly 11-year-old headspace, I decided to attempt. But thankfully I didn’t succeed. In addition to getting the news that my single mom had been diagnosed with Multiple Sclerosis, there was a girl who literally threatened to kill me every day. Every day in 6th period, she would whisper violent things in my ear. And I would find pictures she had drawn of me dying in different ways that she had stuffed in my locker. I was also violently beat-up by another group of girls on my walks home from school. My mom was desperate to find me help, but the administration did little to nothing about the situation. So, with the help of my uncle, she got enough money together for tuition to transfer me to a private school. This decision to remove me from the school was everything – and it was a life saver. Every time I see one of these other stories about a young kid who wants to kill themselves, all I can think is, “That could have easily been me.” I was very quiet about what was happening to me, I wasn’t really talking about it. But thank God my mom was intuitive enough to know I wasn’t ok – and her decision to act on her intuition probably saved my life. And paved the way for the successful future I have today. That’s why this project is very sacred to me. Every step of the way, I try to jump back into the headspace of my timid, discouraged 11 year old self so I keep in mind why we need to tell this story. Cady: Bullying comes in many forms. For me, it came in the form of sexually aggressive comments on film and TV sets. I realise now there was fear behind them, but it did not make their impact less, nor their intent any less heinous. It made me feel like my presence, my ability, formed a threat to others. The constant sexualization of my younger female self (not just by men, mind you) drove me to work hard in the creative arts where I had more control. As I am now a mature woman in her 40’s, I realise now how important it is to value the power one has, and to protect it. Even if no one else will. 5. What advice would you give to those who are experiencing bullying? Audrey: My best advice would be to remember that people’s toxic, hurtful words have more to do with them than they do with you. When girls are “mean girls,” it has more to do societal and systemic profiting off of woman and insecurity. It’s a vicious cycle – but girls and woman put down other girls and women because they have been taught to be insecure. We have to end this cycle of pettiness. We have to start lifting each other up – not keep tearing each other down. That’s why this project is so special – it specifically targets bullying of girls, by other girls. This needs to be tackled. Head-On. Cady: My advice to those who are experiencing bullying is: remember it is not about you. It is all a reflection of that person’s fear. You did nothing wrong. What would be wrong would be for you to diminish your light because of their words. Carlotta: Don’t give in. That’s what they want more than anything, for you to give in and experience whatever hardships they are going through. They see you as something that threatens them for whatever reason. You threaten their beliefs, you threaten their preconceptions, you threaten to over shadow their work in some way, etc. You have something that they desire. Some people just want to take your happiness. Do not let them. The most powerful thing you can have is the ability to say ‘no, I will not let you interfere with my dreams.’ And then after you say that, go after your dreams and leave them behind. At my lowest point, I felt like I didn’t have even the right to exist. And following a certain path would have changed the course of my life. I chose not to follow that path. I now look back on that moment as decisive, as if I had been given a second chance at life and that whatever I do now, I do it with no regrets. And I think that that mentality can help other people. Do not let those who wish you harm have that power over you. 6. What advice would you give to those who are doing the bullying? Carlotta: I remember being in the opposite position my final years of high school. High school is hard. It is like a mini-society where we are all crammed together in a cacophony of adolescent angst. At the time, I no longer wanted to be the target of bullying, but ‘how does one do that?’ I thought. The easiest answer, following biology, is if you don’t want to be hunted, you do the hunting. So, for a while, I became the aggressor. And then it hit me. I was teasing to prevent myself from being teased. I am now a part of the problem. My question to those who bully would be, in all earnestness: does that make you feel good? Does it solve the issue that you have inside? Does it make you feel more powerful? Examine that. Do it when you are alone where no one can see or judge you and really think about why you do it. For the moment yes, it does make you feel better. But let’s just take away the fact that it is instantly gratifying. What have YOU achieved? You have made someone feel pain. Yes. But is that what you really want? What do YOU want? Take that energy and that idea of what you really want and go after that. And if you can’t get what you really want in life, use your creativity, because we all have that, and find out a way to give back. Because karma is a real thing. Most importantly: Do not take it out on others, because not only is it hurtful, it’s not giving YOU what you REALLY want. Audrey: I agree. Examine why you are saying and doing these awful things. Where is it coming from? Often times, as I mentioned before, many people put others down because of their own insecurity. Our subconscious insecurities can make us act rather cruelly towards others. If you have even a shred of potential guilt and think, “Yeh, maybe I’ve bullied before” – just know you are not a bad person. It’s never too late to turn it around and do the right thing. 7. Is there anything you would like to add? Cady: Carlotta’s film is a beautiful portrait of a young girl at the moment of discovering both her voice and identity. In order to hold onto them, she has to develop skills all girls and women must acquire in order to stay authentic. I came onboard because of the inherent beauty of the writing, but also because I believe Carlotta and Audrey will create a piece that will inspire more women and girls to “raise their hand,” recognise the value of what they have to contribute. Audrey: To any adult women out there who have been bullied: examine how those experiences in your adolescent developmental years still shape your behaviour and actions in your adult life. That’s why I loved the script and the overall scope of the feature version – it dives into the developmental affects bullying has on girls. And I think understanding gets you one step closer to healing. And this film highlights the positive transformation girls are capable of accessing. As with Carlotta and I, we overcame. We healed. We’re entering a new age of women. Every day I witness more and more women taking new positions of power, breaking new boundaries, shattering new glass ceilings, and standing up for themselves in new ways. I hope our film can be a part of this movement. Overcoming bullying and toxicity is a part of this new age. Carlotta: I have partnered with some amazing, inspiring women to help make this film a reality. I believe in the power of cinema and theatre to help raise consciousness for issues as well as provoke change. With a medium that can influence so many young voices, this film has the potential to help save someone who needs it. If I can just reach out to one young girl, through this film, it would mean everything. With that being said, we need help getting this off of the ground. We are currently in Pre Production. I ask that anyone who is interested, SHARE this interview and SHARE and FOLLOW our Facebook page and Twitter . We will be constantly posting updates on when we are casting, progress on the film, and how you can contribute when the time comes. We also have a powerful campaign called #RaiseYourHand, a movement showing the importance of children raising their hand in class, despite the negative influences surrounding them. Send a picture of you raising your hand, like the ones on the webpage listed above, to [email protected] and we can display it! Everyone who is reading this is beautiful, intelligent and worth it. Remember that.